Sharing is caring, and you can save a Word, Excel, or PowerPoint file on your iPad or desktop computer directly to a OneDrive folder. After the file lands on OneDrive, others who have access to the folder on OneDrive can open the file. They can open it in an Office for the iPad application, Office web App, or an Office 2010 program (if Office 2010 is installed on their computers). In an Office for the iPad application, tap the Office button. Locate the file you want to move. To do so, tap Recent or Open and navigate in the Office window until you see the name of the file you want to move. Tap the Share icon next to the file’s name. The Choose Name and Location window appears. Choose a location on OneDrive to store your file. Select a folder, for example. 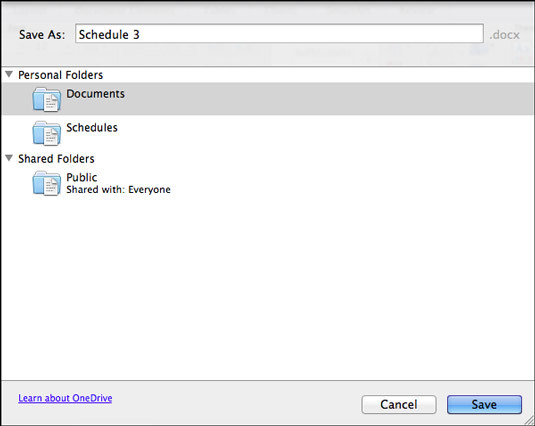 In an Office 2011 program, choose File→Share→Save to OneDrive. You see the Save As dialog box. It shows folders you keep on OneDrive. If you aren’t signed in to Office 365, you see the Windows Live Sign In dialog box. Enter your Office 365 user ID and password in this dialog box, and click Sign In. Select a folder in which to save the file. On the Mac, saving a file to OneDrive.